Tue., July 11, 2017, 1:15 p.m. The Silver Dollar Fire took out no structures as it burned across more than 30,000 acres in Benton and Yakima. But it wreaked havoc on one of the botanical treasures of the Hanford Reach National Monument. Growing high above the Columbia River is a yellow flowering plant that is found nowhere else in the world. Umtanum desert buckwheat was discovered in 1995 and has been protected under the Endangered Species Act since 2013. By the last count, conducted in 2011, there were 5,169 of the plants on the area of the monument called the McGee Ranch southwest of the Vernita Bridge on the Columbia River. “They are not fire tolerant,” said Heidi Newsome, a biologist with U.S. Fish and Wildlife. An initial check shows at least half the plants are affected, she said. More could die from the stress of the fire’s heat, with the toll not known until next year. She plans a more complete assessment of the plants later this month with a rare plant botanist from the state Department of Natural Resources. The plant is named for the Umtanum Ridge, the steep, northfacing basalt cliffs overlooking the Columbia River. It grows on the top edges of the slopes at elevations between 1,100 to 1,320 feet. It’s a low-growing, woody plant, with flowers that bloom on the end of stalks about 2 inches long from May to August. It can spread in mats up to 28 inches wide. Growth is very slow, and some plants may be more than 100 years old. Their remote location on the rocky edge of the ridge provides some protection from fires most years. But this year’s wet winter and spring allowed plant growth to carry fire into the Umtanum desert buckwheat population, Newsome said. The plants survived a previous wildfire, with just 10 to 20 percent killed. In 1997 a wildfire spread onto the McGee Ranch from the U.S. Army’s Yakima Training Center. The next year their population was damaged by trespassing dirt bikers. The area was later fenced off to keep off-road vehicles and cows away from the plants. The McGee Ranch portion of the monument is closed to the public. Newsome knows there are some islands of plants that did not burn in the recent fire. “I hope we can collect seeds,” she said. When the Hanford Reach was created in 2000 by presidential proclamation, the species was called out in the document as one of two plant species there new to science. 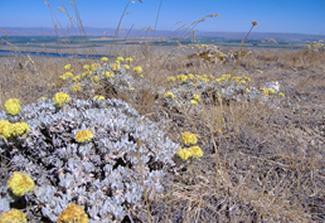 The other is the White Bluffs bladderpod that grows on the other side of the Columbia River. “The most sad thing is these human-caused fires are preventable and they have such big impacts on the really rare species in our area,” Newsome said. The cause and the location where the Silver Dollar Fire started July 2 have not been determined, but Bureau of Land Management officials have said it was caused by people. The other endangered species harmed by wildfires in recent weeks were pygmy rabbits. On June 28 the Sutherland Canyon wildfire overran the 10-acre Beezley Hills breeding compound for the rabbits. The state Department of Fish and Wildlife, which operates the compound on private land, estimated about 70 pygmy rabbits died and 30 were evacuated. Surviving rabbits were found as recently as July 6. The survivors have have been taken to other state breeding compounds. Published: July 11, 2017, 1:15 p.m.